Difference between revisions of "Esophageal web"
Esophageal webs are mucosal folds that partially obstructs the esophageal lumen. The exact pathogenesis of esophageal webs is not known but it is thought to be due to either esophageal inflammation, congenital anomaly, or iron deficiency. They can be classified into type A, B, and C according to their site and extent; type B being the most common. The most common causes are Plummer-Vinson syndrome, celiac sprue and Zenker’s diverticulum. 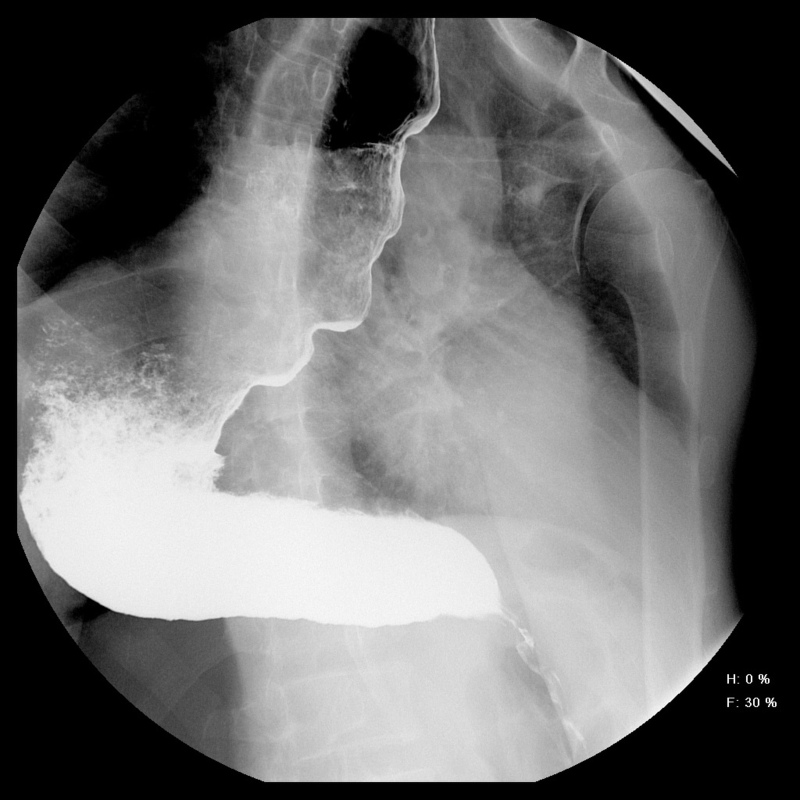 Esophageal webs most commonly present with dysphagia that has a slow onset and is rarely complicated with weight loss. Esophageal webs must be differentiated from other causes of dysphagia such esophageal strictures and achalasia. 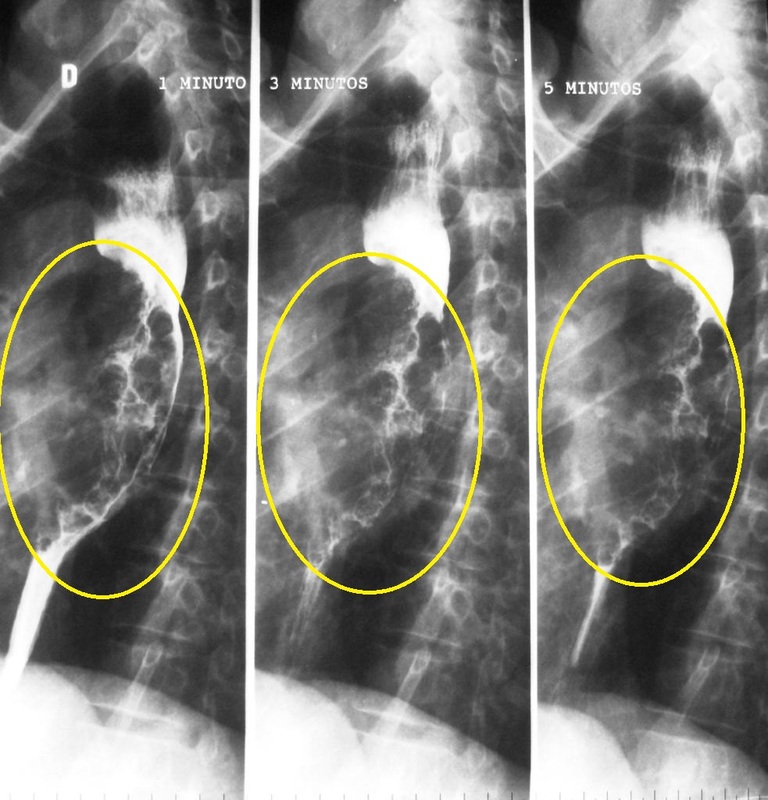 In barium esophagogram, esophageal webs appear as a uniform narrowing of the esophagus and on endoscopy, esophageal webs appear as a smooth narrowing of the esophagus that is not present in the whole circumference of the lumen. Esophageal dilation is the cornerstone of treatment and it is effective in relieving the symptoms but with high recurrence rate. In 1944, esophageal webs were first described by Templeton and it was thought to be a congenital disease because most of the patients were children. In 1953, a series of case reports of patients having dysphagia and radiological signs denoting esophageal narrowing made the diagnosis of esophageal rings not confined to the pediatric population. In 1968, histological examination of specimens from the esophageal rings proved that none of them had muscle involvement. Type A esophageal rings describe webs that involve the muscle layer of the esophageal wall and lies in close proximity to the squamo-columnar junction. It is less common than type B esophageal webs. Type B esophageal rings describe the webs that involve only the mucosa and submucosa of the esophagus. It is often named “Schatzki ring”. It is located exactly at the squamo-columnar junction. 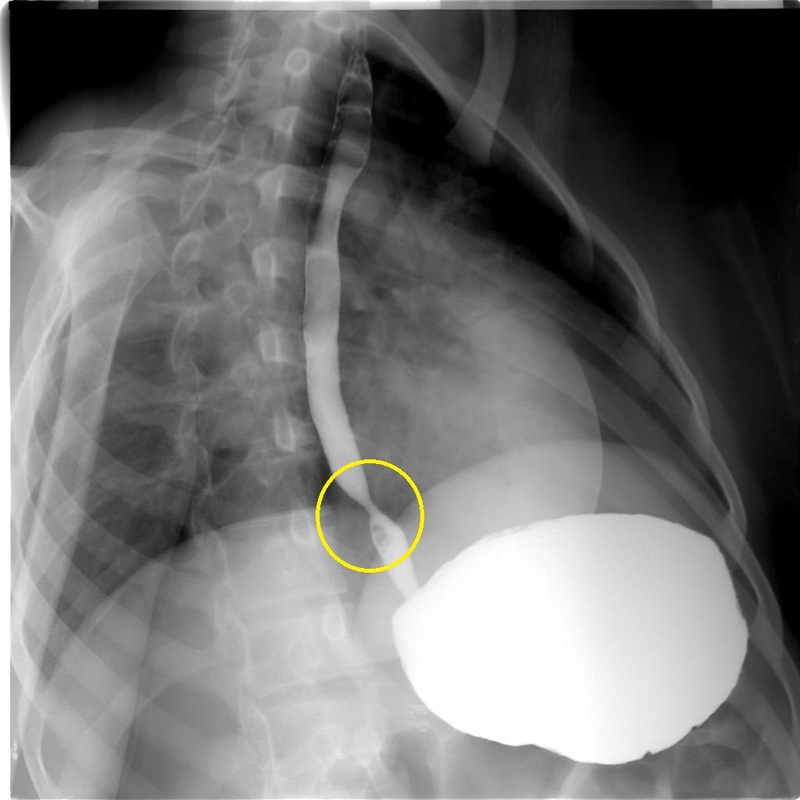 Type C esophageal rings refer to wall invaginations due to pressure from the diaphragm. It is rare with no clinical significance. There are multiple theories explaining the origin of esophageal webs. Esophageal webs are thought to be due to the chronic damage to the esophageal mucosa. This is supported by the presence of inflammatory cells in the wall of the web. In eosinophilic esophagitis, eosinophils were found while in cases of chronic inflammation as GERD, lymphocytes prevailed. 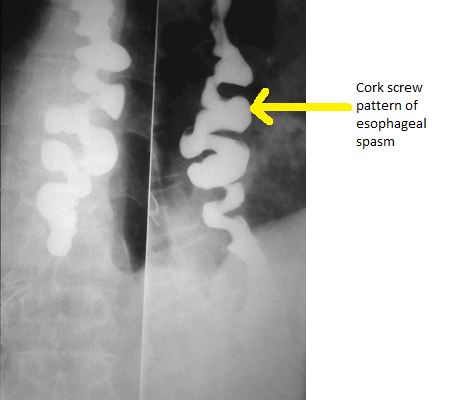 Esophageal webs are thought to be due to failure of the esophagus to recanalize. Specimens showed that the esophageal webs contained respiratory epithelium supporting this theory. The webs mostly remain asymptomatic for long times and that is why it is not correlated with being congenital. The esophageal webs of Plummer-Vinson syndrome have been associated with iron deficiency anemia in many studies. The exact mechanism by which iron deficiency causes esophageal webs is not known, but it was hypothesized that iron deficiency starts a sequence of events in the esophageal epithelium that ends in its damage and formation of a web. Moreover, treatment of iron deficiency in Plummer-Vinson syndrome patients leads to resolution of dysphagia even before the laboratory results become normal. Esophageal webs appear as an eccentric narrowing of the esophageal lumen (while rings cause circumferential narrowing). Esophageal webs are covered normally by mucosa and submucosa. It is characterized by the presence of basal cell hyperplasia. The tissue is often heavily infiltrated with chronic inflammatory cells. Eosinophilic esophagitis is characterized by the presence of eosinophil infiltration. Esophageal webs must be differentiated from other causes of dysphagia such as achalasia and esophageal carcinoma. 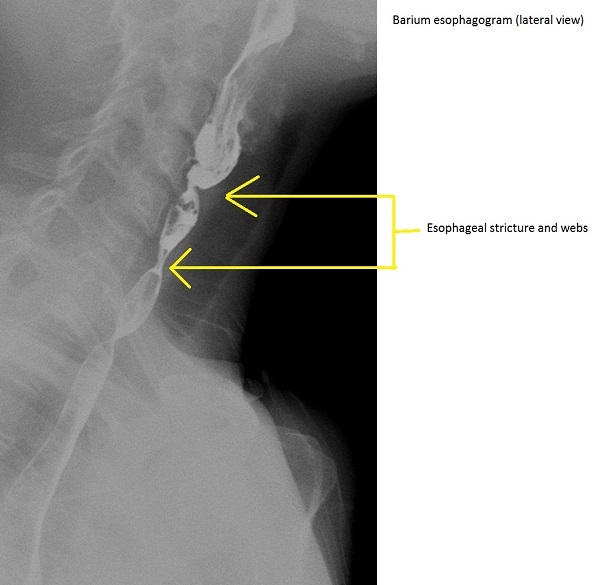 Webs are diagnosed in 5-15% of patients doing barium esophagogram for diagnosing the cause of dysphagia. Congenital esophageal webs are estimated to be 1 in 25,000 to 1 in 50,000 live births. Esophageal webs affects the whites more than other population. Esophageal webs tend to be more common in females. This may be due to the increased prevalence of iron deficiency anemia. Esophageal has no predilection for an age group, however, it is usually not symptomatic until after the age of 40. According to USPSTF, there are no screening measures recommended for esophageal webs. The disease can start at any age but symptoms usually start in the fifth decade of life. The dysphagia is usually to solids at the beginning then it progresses to both solids and liquids. If left untreated, the webs may progress causing esophageal strictures and esophageal carcinoma. Esophagitis from chronic injury of the mucosa. The prognosis of esophageal webs is generally good especially with treatment of the underlying cause. One of out of ten patients with Plummer-Vinson syndrome will develop esophageal carcinoma. Patients are usually older than 40 years because it can be asymptomatic for a long time. The patient may give a history of the cause such as iron deficiency anemia, GERD, or autoimmune disease. There may be a history of excessive food chewing to facilitate swallowing. Most of the esophageal webs are asymptomatic. The major symptom of esophageal webs is dysphagia. Dysphagia is usually more for solid food. Esophageal webs do not usually result in malnutrition nor to weight loss. Koilonychia and glossitis in the cases of Plummer-Vinson syndrome. It might also show the findings in in the cases of skin disorders such as epidermolysis bullosa, bullous pemphigoid, and pemphigus vulgaris. A Laboratory workup is not necessary for the diagnosis of esophageal webs because the diagnosis is dependent on the symptoms and radiological tests. CBC might show microcytic hypochromic anemia in cases of Plummer-Vinson syndrome as it is the primary cause of the esophageal web. Antibody panel might be done to screen for the primary cause. Barium esophagogram is more sensitive in detecting esophageal webs than endoscopy. Webs appear as a uniform narrowing of the esophageal lumen. Endoscopy is less sensitive in detecting webs than barium esophagram. Esophageal webs appear as a smooth membrane that is not encircling the whole lumen. It allows obtaining a biopsy from the lesion in addition to excluding other causes of dysphagia. Esophageal webs can go unnoticed during the esophagram as it is only a mucous membrane fold with no muscle support. Patients should be educated to change their diet and food habits, especially in the cases when esophageal webs are secondary to GERD. H2 blockers or proton pump inhibitors can be used for managing the symptoms of GERD and the prevention of progression to webs. Proper management of acid reflux after esophageal dilation is associated with decreased recurrence of symptoms. Esophageal dilation is the cornerstone of treating esophageal webs especially in cases refractory to medical treatment. In cases of eosinophilic esophagitis, dilation should be gradual as sudden forced dilation is associated with muscle tears. In cases of non-eosinophilic esophagitis, dilation using a single dilator is more effective than graded dilation. Esophageal dilation is associated with improved dysphagia. Esophageal dilation is associated with symptom recurrence in about 89% at five years and often requires redoing of the procedure. ↑ 1.0 1.1 1.2 1.3 Okamura H, Tsutsumi S, Inaki S, Mori T (1988). "Esophageal web in Plummer-Vinson syndrome". Laryngoscope. 98 (9): 994–8. doi:10.1288/00005537-198809000-00014. PMID 3412097. ↑ HARDY JD, CONN JH (1962). "Diseases of the esophagus: an analysis of 308 consecutive cases". Ann. Surg. 155: 971–90. PMC 1466157. PMID 13904659. ↑ 3.0 3.1 3.2 3.3 Smith MS (2010). "Diagnosis and management of esophageal rings and webs". Gastroenterol Hepatol (N Y). 6 (11): 701–4. PMC 3033540. PMID 21437018. ↑ Mann NS, Leung JW (2005). "Pathogenesis of esophageal rings in eosinophilic esophagitis". Med. Hypotheses. 64 (3): 520–3. doi:10.1016/j.mehy.2004.08.021. PMID 15617859. ↑ Pleet JL, Taboada S, Rishi A, Milman PJ, Trindade AJ (2017). "Rings in the esophagus are not always eosinophilic esophagitis: Case series of ring forming lymphocytic esophagitis and review of the literature". Endosc Int Open. 5 (6): E484–E488. doi:10.1055/s-0043-106579. PMC 5451283. PMID 28573181. ↑ 6.0 6.1 Sinha SK, Nain CK, Udawat HP, Prasad KK, Das R, Nagi B, Singh K (2008). "Cervical esophageal web and celiac disease". J. Gastroenterol. Hepatol. 23 (7 Pt 1): 1149–52. doi:10.1111/j.1440-1746.2008.05452.x. PMID 18554241. ↑ DeVault KR (1996). "Lower esophageal (Schatzki's) ring: pathogenesis, diagnosis and therapy". Dig Dis. 14 (5): 323–9. PMID 8902418. ↑ 8.0 8.1 McDonald GB, Sullivan KM, Schuffler MD, Shulman HM, Thomas ED (1981). "Esophageal abnormalities in chronic graft-versus-host disease in humans". Gastroenterology. 80 (5 pt 1): 914–21. PMID 7009315. ↑ Low DE, Hill LD (1988). "Cervical esophageal web associated with Zenker's diverticulum". Am. J. Surg. 156 (1): 34–7. PMID 3134826. ↑ Weinman D, Stewart MI, Woodley DT, Garcia G (1991). "Epidermolysis bullosa acquisita (EBA) and esophageal webs: a new association". Am. J. Gastroenterol. 86 (10): 1518–22. PMID 1928049. ↑ Dutta U, Khaliq A, Noor MT, Kochhar R, Singh K (2009). "Recurrent Multiple Cervical Esophageal Webs: An Unusual Presentation of Celiac Disease". Gastroenterology Res. 2 (6): 356–357. doi:10.4021/gr2009.12.1325. PMC 5139698. PMID 27990207. ↑ Gordon AR, Levine MS, Redfern RO, Rubesin SE, Laufer I (2001). "Cervical esophageal webs: association with gastroesophageal reflux". Abdom Imaging. 26 (6): 574–7. PMID 11911167. ↑ Jerome-Zapadka KM, Clarke MR, Sekas G (1994). "Recurrent upper esophageal webs in association with heterotopic gastric mucosa: case report and literature review". Am. J. Gastroenterol. 89 (3): 421–4. PMID 8122657. ↑ Andersson GB, Schultz AB, Ortengren R (1986). "Trunk muscle forces during desk work". Ergonomics. 29 (9): 1113–27. doi:10.1080/00140138608967227. PMID 3769895. ↑ Goel A, Bakshi SS, Soni N, Chhavi N (2017). "Iron deficiency anemia and Plummer-Vinson syndrome: current insights". J Blood Med. 8: 175–184. doi:10.2147/JBM.S127801. PMC 5655134. PMID 29089792. ↑ Tahara T, Shibata T, Okubo M, Yoshioka D, Ishizuka T, Sumi K, Kawamura T, Nagasaka M, Nakagawa Y, Nakamura M, Arisawa T, Ohmiya N, Hirata I (2014). "A case of plummer-vinson syndrome showing rapid improvement of Dysphagia and esophageal web after two weeks of iron therapy". Case Rep Gastroenterol. 8 (2): 211–5. doi:10.1159/000364820. PMC 4086037. PMID 25028578. ↑ Lawrence IE (1968). "Regional influences on development of the single comb primordium". J. Exp. Zool. 167 (3): 263–73. doi:10.1002/jez.1401670302. PMID 5655134. ↑ Novacek G (2006). "Plummer-Vinson syndrome". Orphanet J Rare Dis. 1: 36. doi:10.1186/1750-1172-1-36. PMC 1586011. PMID 16978405. ↑ Roy GT, Cohen RC, Williams SJ (1996). "Endoscopic laser division of an esophageal web in a child". J. Pediatr. Surg. 31 (3): 439–40. PMID 8708922. ↑ Chao HC, Chen SY, Kong MS (2008). "Successful treatment of congenital esophageal web by endoscopic electrocauterization and balloon dilatation". J. Pediatr. Surg. 43 (1): e13–5. doi:10.1016/j.jpedsurg.2007.08.059. PMID 18206438. ↑ Kitahara S, Ohmae Y, Ogura M, Matumura Y (1999). 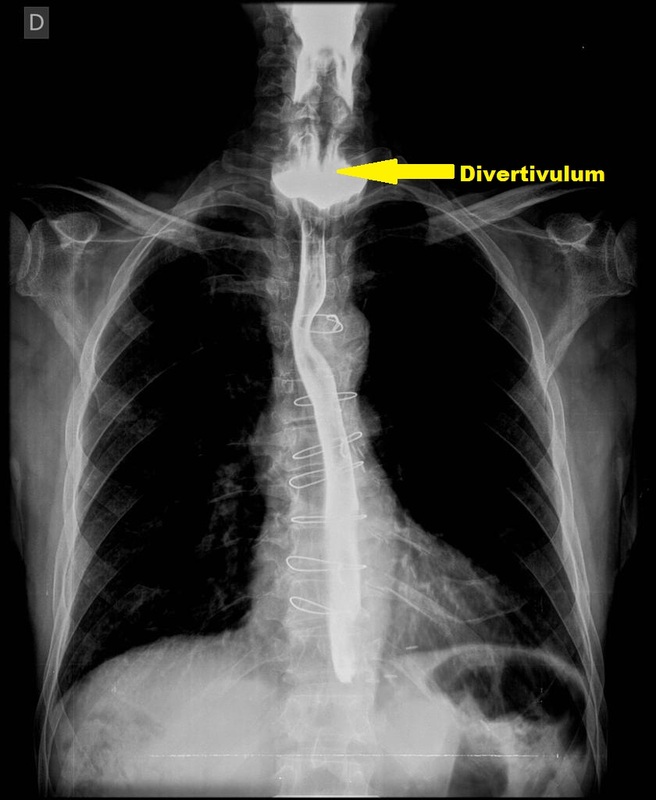 "The operation of upper esophageal web in Plummer-Vinson syndrome: a case report". Auris Nasus Larynx. 26 (4): 495–500. PMID 10530747. ↑ Longstreth GF, Sitzer ME (1997). "Multiple esophageal webs: treatment and follow-up of seven patients". J. Clin. Gastroenterol. 24 (4): 199–202. PMID 9252840. This page was last edited 22:10, 7 February 2019 by Ahmed Younes. Based on work by C. Michael Gibson, Alexandra, Cafer Zorkun, Katherine Ogando and Alexandra Almonacid, wikidoc users Mehrian.jafari and WikiBot and wikidoc anonymous user Arcadian.